Zero Fee Guarantee - you pay nothing until a recovery is made on your behalf. An award winning law firm backed by power & experience. The law firm of Keller & Keller has served the legal needs of injured people since 1936. The firm continues to expand and has played a vital role in helping our clients fight insurance companies 75 years later. We know that choosing the right law firm is a decision you may only make once in your life, and there are many choices. The law firm you choose should be a group you can trust, a law firm with experience, and one that has decades of success and proven results. Our vast and diverse network of experts and legal resources are luxuries we can call on at any time for any case. 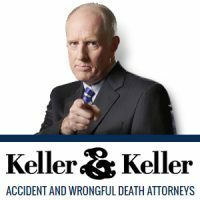 Why Choose Keller & Keller To Be Your Lawyers? We are proud members of the American Trial Lawyers Association. If your accident has left you with questions about your medical bills, lost wages, or pain and suffering, we can help. The day you hire us is the day we start working on your case.